Sameer in his role as Creative Director, sets the vision and design direction for most of our projects. Having had a successful IT career, Sameer’s passion for horticulture and the transformative power landscape holds for shaping the social fabric of community led him to switch careers. He draws his inspiration from one simple principle “OBSERVATION”. He finds creativity in everything from nature, art, fashion, food and other design disciplines. But understanding the cultural context and the social possibilities of a space helps drive the vision. 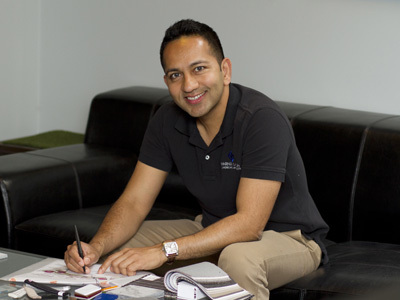 Sameer is currently enrolled in his Masters of Landscape Architecture at the BAC. He holds a Masters in Computer Science from Worcester Polytechnic Institute. Outside of work, Sameer stays involved with his neighborhood communities and in the urban development process. His other interests are outdoor recreational activities such as hiking, kayaking along with tennis, gardening and entertaining (cooking).